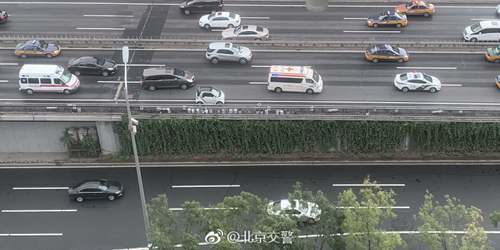 Concerns from netizens helped clear traffic from expressways so that a boy with traumatic brain injuries from a car accident could be transported quickly from the Inner Mongolia autonomous region to Beijing on Tuesday. On Monday evening, a WeChat post titled "Relay for Life" went viral. It indicated the license plate numbers of the ambulance carrying the boy and two other vehicles in the convoy, as well as their departure time and driving route, and called on surrounding vehicles to give way to them. At 5:15 am on Tuesday, accompanied by medical staff from 999 Emergency Center, the ambulance began the 500 kilometer trip and was scheduled to arrive at 1 pm. Traffic police from Inner Mongolia, Hebei province and Beijing coordinated a special route and broadcast the message through various traffic radios, which allowed them to get to Beijing Tiantan Hospital at 10:36 am, almost two and a half hours earlier than expected. Song Yong, the ambulance driver, said: "Thanks to the help of the traffic police, we barely ran into any traffic congestion during the journey. When we arrived in Beijing, the local police escorted us all the way to the hospital." Zhang Dachun, chief physician at the centre, said: "The boy is in a coma, and his breathing and blood pressure is extremely weak. In addition to me, the centre also arranged two nurses to take care of him." The 13-year-old boy, Yuze, a second-year middle school student at Beijing Normal University Experimental School, was on his way to Inner Mongolia on Oct 3 for a vacation with his father, grandmother and aunt when their car struck something on the road that the father said looked like a tire. That caused their car to break down and the four of them got out. Suddenly another car ran into the same item and flipped over. The car landed on the family, severely injuring Yuze and killing his grandmother and aunt. The boy was sent to Inner Mongolia People's Hospital for treatment for multiple fractures and brain injuries. After treatment in Hohhot, the regional capital, he was still in a deep coma and was not breathing spontaneously. He now relies on a ventilator to breathe, Tiantan Hospital said. Though the boy's condition is not looking good, the hospital said that it will spare no efforts to save him. The hospital communicated with the hospital in Hohhot and made full preparations for his treatment, it said. "I really thank everyone who helped us during the whole journey," Yuze's mother said. "Without your help, we couldn't have made it that fast. Yuze has always dreamed of becoming a doctor when he grows up. I hope he can wake up and realise his dream."